If you’re shopping around for a midsize SUV, you understand the importance of doing your research. You realize that space is needed, technology makes the drives more enjoyable and savings is a top priority. With so many options in the midsize SUV category, we want to help make your search easier. 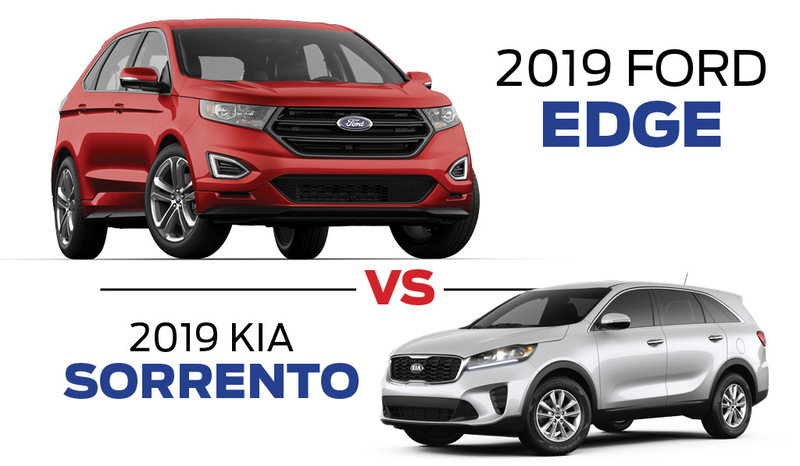 The Ford Store San Leandro did the research on how the 2019 Kia Sorento and 2019 Ford Edge compare. See why the Edge SUV is the better buy. But where the 2019 Ford Edge truly shines is with its cargo space. It boasts 39.2 cu.ft behind the rear seats. With the rear seats folded, drivers can get 73.4 cu.ft of space. The 2019 Kia Sorento falls short with less cargo space with the third rows folded down and overall. If want the latest tech in your midsize SUV, you’ll be pleased with the 2019 Ford Edge. Both the 2019 Ford Edge and 2019 Kia Sorento get impressive mileage. With its standard EcoBoost turbocharged 2.0-liter four-cylinder engine, the Edge gets an EPA estimated 22 mpg in the city and 29 mpg in the city. The 2019 Ford Edge also packs a powerful punch 250 horsepower. The 2019 Kia Sorento comes standard with a 2.4-liter four-cylinder engine cylinder and gets the same EPA estimated 22 mpg in the city and 29 mpg on the highway but it only pushes out 185 horsepower. Hurry to The Ford Store San Leandro to save on the new 2019 Ford Edge. We invite you to stop by our dealership in San Leandro and explore the full lineup of new Fords near you. To learn more about the Edge or for a test drive, visit us now.